Most of us, no matter how diligent we are about our meals, have a soft spot for fast food. There’s just something about fast food that makes us happy. It’s convenient, cheap, and reminds of childhood. I must confess, my fast food weak spot is the fried chicken sandwich. Everything I love about the South is wrapped up in that delicious sandwich. 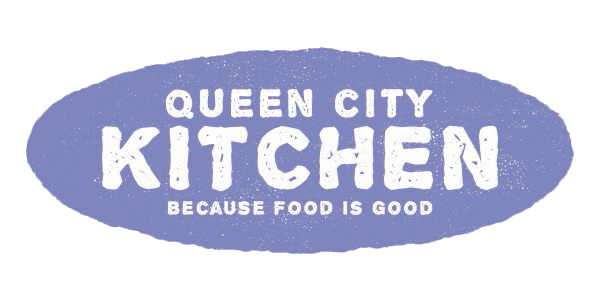 It’s fried, comforting, and served with great hospitality and a smile. Sometimes I get a hankering for a delicious chicken sandwich, and I have to make a fast food run to satisfy my craving. Of course, the last time I had this craving it was on a Sunday. The restaurant was closed, and I headed home without a delicious chicken sandwich. Instead of driving directly to the house, I made a detour to the market and purchased a pack of chicken thighs and a jar of bread and butter pickles. I was determined to have my delicious chicken sandwich. The sandwich was amazing and everything I wanted and more. I was vindicated and satisfied. And I didn’t have to wait until Monday. Whisk the mayonnaise, ketchup and hot sauce until combined. Refrigerate until ready to use. Season the chicken with salt and pepper, and place in a gallon-size resealable plastic bag. Add ½ cup hot sauce, seal the bag, and shake until the sauce is evenly distributed. Marinate in the refrigerator for at least 2 hours or up to overnight. Fill a Dutch oven or large pot with about 3 inches of oil; add the shortening. Heat the oil to 360 degrees F over medium heat. Line a large baking sheet with paper towels and set aside. Whisk the flour, cornstarch, seasoning salt, ½ teaspoon salt, ½ teaspoon pepper in a large bowl until combined. Dredge the chicken in the flour to coat and transfer to a plate. Combine 1 cup of buttermilk and 2 tablespoons hot sauce in another large bowl. Add the remaining ¼ cup buttermilk to the flour and stir with a fork until the flour has a shaggy texture. Dip the chicken thigh in the buttermilk mixture, letting the excess drip off. Dredge in the flour mixture, pressing the chicken into the flour to fully coat with shaggy clumps. Transfer to a plate and repeat with the remaining chicken thighs. Gently place the coated chicken into the heated oil and fry until golden brown, about 5 minutes, turning the chicken as needed for even cooking. Transfer the chicken to the prepared baking sheet to drain. Toast the buns cut-side up under the broiler until golden brown, about 2 minutes. 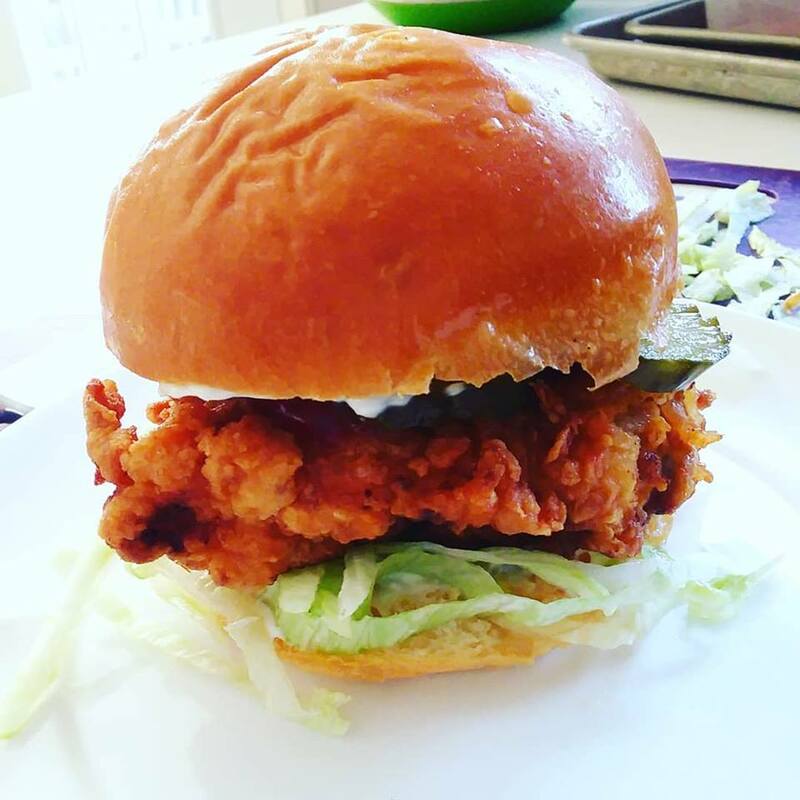 Place 4 pickles on each bottom bun, add a piece of fried chicken and drizzle with sauce. Top with shredded lettuce, cover with bun lids, and serve. 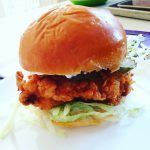 This entry was posted in Chicken, Entree, Recipes, Sandwiches and tagged chicken sandwich, fast food at home, fried chicken on October 6, 2018 by Andria Gaskins.